After watching a series of backup quarterbacks slog to a collective 1-11 record in his absence last season, we get the feeling Dallas Cowboys quarterback Tony Romo understands how important his health is to the team. 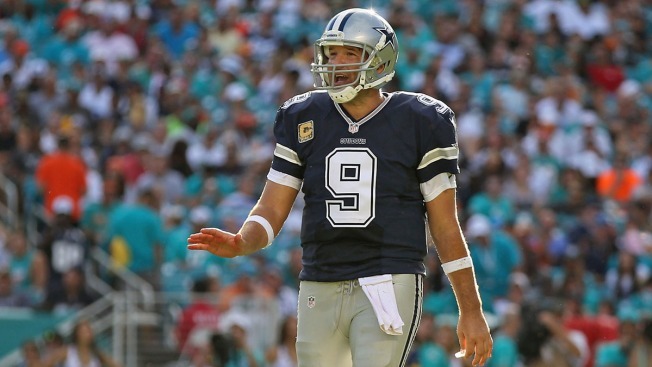 "I don't sit around and analyze how I'm viewed necessarily," Romo said recently, per Todd Archer of ESPN Dallas. "I do know that when I can play football, it helps our football team. That's why you work as hard as you do, to give yourself every opportunity to be out there on Sundays and winning football games." The good news is Romo seems to be bouncing back nicely from his latest surgery—the Mumford procedure, which involves shaving the collarbone down at the shoulder to increase the stability of the bone—to the point that the four-time Pro Bowler’s health has been the talk of OTAs thus far. “Tony has looked phenomenal," said quarterbacks coach Wade Wilson. “This is the best stretch I've seen him in the spring in a long time. There are no effects from any of the injuries. He still does a routine to take care of his back, but he's done his full workload out here. He hasn't gotten out of anything.